On Nov 22nd, Egbegbe was arrested at Computer village, Ikeja for allegedly stealing 9 iPhones, and was handed over to the police by the traders. Although Egbegbe released a statement denying the allegations, we have however confirmed and revealed that after police investigation and two nights in custody, he was charged to court today for stealing. According to Lagos state Police PRO, Dolapo Badmus, "After Discreet Police Investigation and two nights in custody, Seun Egbegbe has been charged to court for stealing." 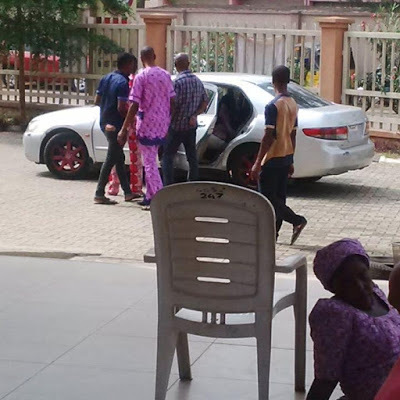 According to an eye witness who sent in these exclusive photos from the court premises, supposed thugs in the presence of Egbegbe's family members, threatened to beat up any journalist who dares to take a photo when he emerges. He has since been granted 1 Million Naira bail and reportedly smuggled out of the court premises to an unknown location to perfect his bail conditions. Failure to do so and he will be remanded in prison custody.